Record, edit, and mix with V-Control Pro. 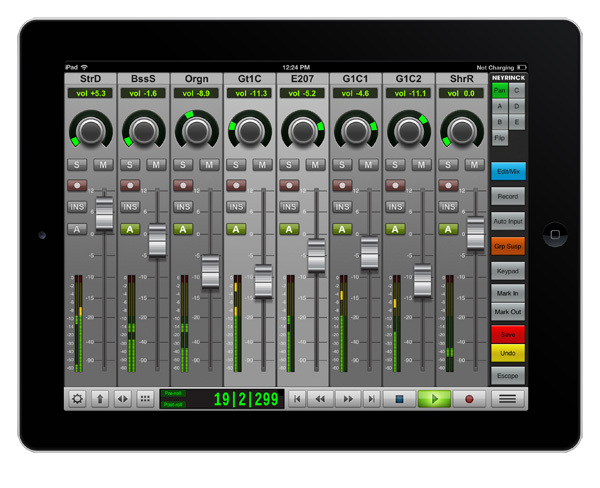 Use beautiful hardware faders or move anywhere with apps on your tablet or phone. Get hands-on control of your audio and video projects using almost any device. 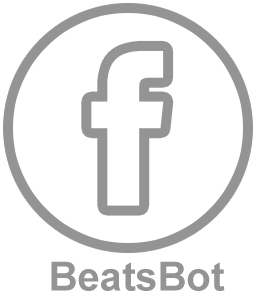 Record and control your DAW remotely while playing your instrument. Mix with multi-touch control from a 16-fader V-Console app. Manage surround panning, including Dolby Atmos, from your tablet or phone. 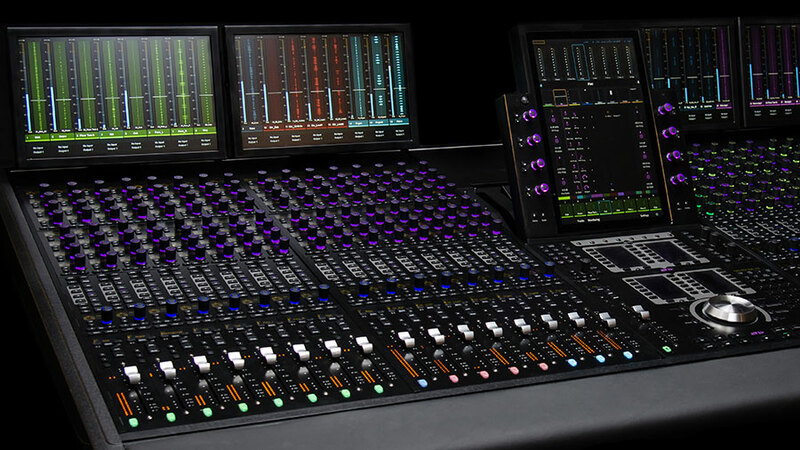 Mix with beautiful faders in Pro Tools (11, 12, 2018, 2019), Logic Pro X, Cubase, and Nuendo with ProControl or Control|24. 32 faders are supported that can be banked to access an unlimited number of channels / tracks. V-Control Pro runs on your Pro Tools computer (Mac or PC) and uses a direct Ethernet connection to ProControl or Control|24. Mac OS 10.10 / Windows 7 and later are supported. 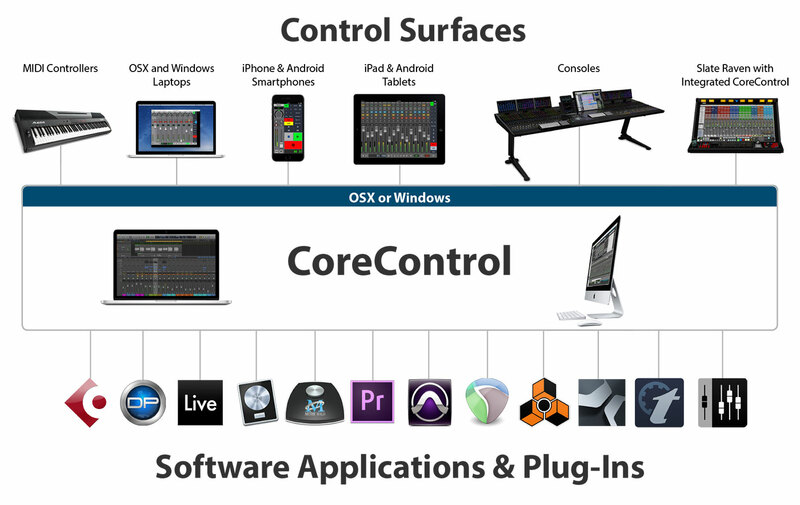 V-Control Pro apps can connect to top media applications via the V-Control Pro Software on both Mac and Windows workstations and laptops. V-Control Pro can control Audition, Cubase, Digital Performer, Live, Logic Pro, MIO Console, Premiere Pro, Pro Tools, Reaper, Reason, Studio One, SONAR and Tracktion and others. CoreControl is a new technology invented by Paul Neyrinck that revolutionizes how control surfaces and software connect. CoreControl is at the heart of V-Control Pro, enabling fast and seamless connectivity between multiple control surfaces and media applications. CoreControl was inspired in part by ASIO, CoreAudio, and MIDI. CoreControl provides the same advantages so everyone’s products can work together. CoreControl is an open-source system that uses standard technologies, which means the end of proprietary protocols and a new beginning of control innovation. 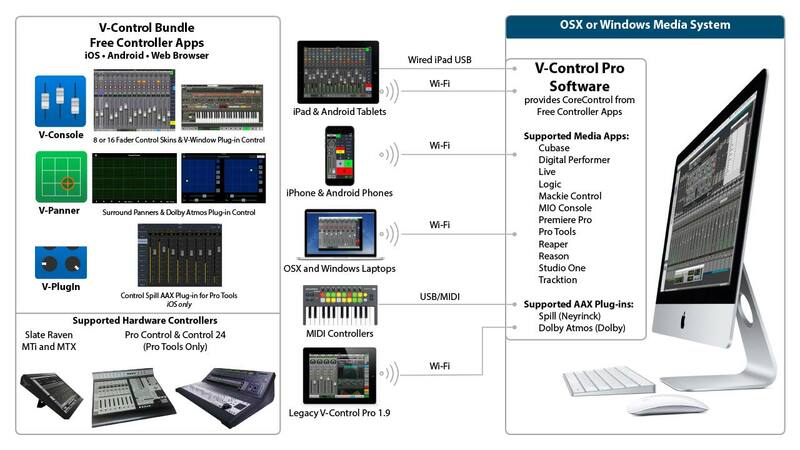 There are several ways to setup and integrate V-Control Pro into your studio or on the road. V-Control Pro software runs as a menu-bar application on your Mac or Windows computer. 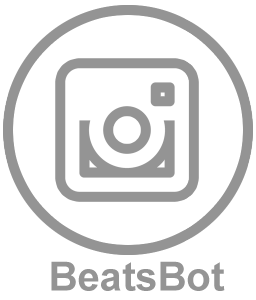 It automatically connects media applications such as Pro Tools, Cubase, and Logic Pro to controller apps and devices. The Setups window shows all your devices, applications, and connected setups. 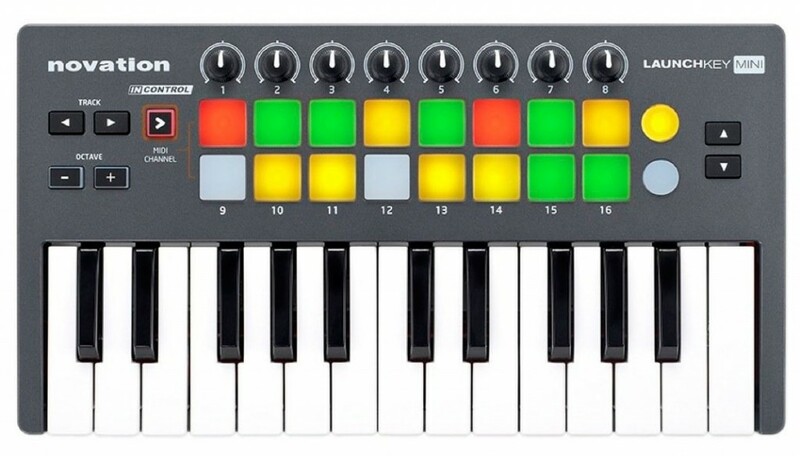 It also provides powerful custom configuration for MIDI controllers. You can see setup guides for all media applications. You can also configure multiple devices for up to 32 tracks of mix control. V-Control Pro provides powerful MIDI features that let you control Pro Tools from MIDI hardware. For example, you can set up recording and playback to be mapped to buttons on a MIDI controller. This information applies to using V-Control Pro simultaneously with an Avid surface that is supported by Pro Tools. This information does not apply to using Pro Control or Control 24 in Pro Tools 11 and later which are not supported by Pro Tools. See above for how V-Control Pro instead supports Pro Control and Control 24 for use with Pro Tools 11 and later. 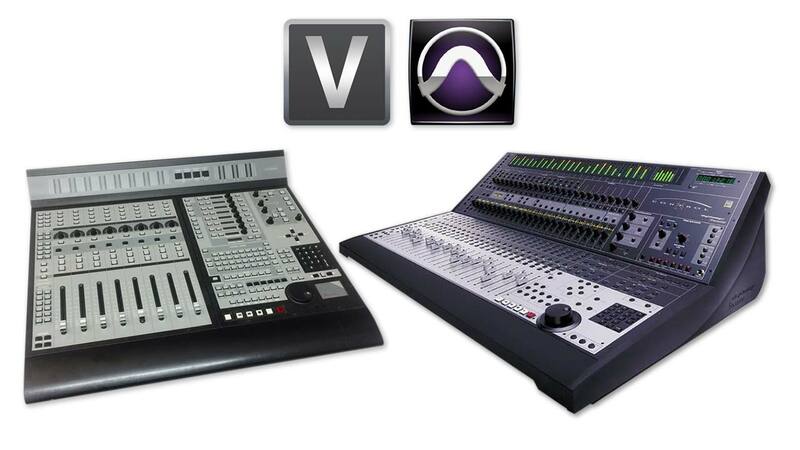 Pro Tools supports using V-Control Pro simultaneous with a supported ethernet controller such as S6, D-Command, C|24. But the two controllers are always banked to the same channels and V-Control Pro is banked to the left eight channels of the ethernet controller. Also, the plug-in editing in V-Control Pro will be disabled. Pro Tools does not transmit metering to V-Control when an ethernet surface is configured in Pro Tools. Avid has verified that Pro Tools does not send metering to secondary controllers. Also, C|24 only allows one additional MIDI peripheral to be used simultaneous. This means you can either set V-Control as one HUI controller or one surround pan controller. To make V-Control Pro operate as an independent controller you can temporarily disable the Ethernet controller in Pro Tools. V-Control Pro 1 for the iPad is fully supported by V-Control Pro Software and does not require a license. Ney-Fi has been renamed to V-Control Pro Software. To use V-Control Pro v 1.9, just download and install V-Control Pro Software and connect just like you did with Ney-Fi previously. At any time you can optionally license V-Control Pro Bundle to get new features such as 32-track control, smartphone control, and Android. 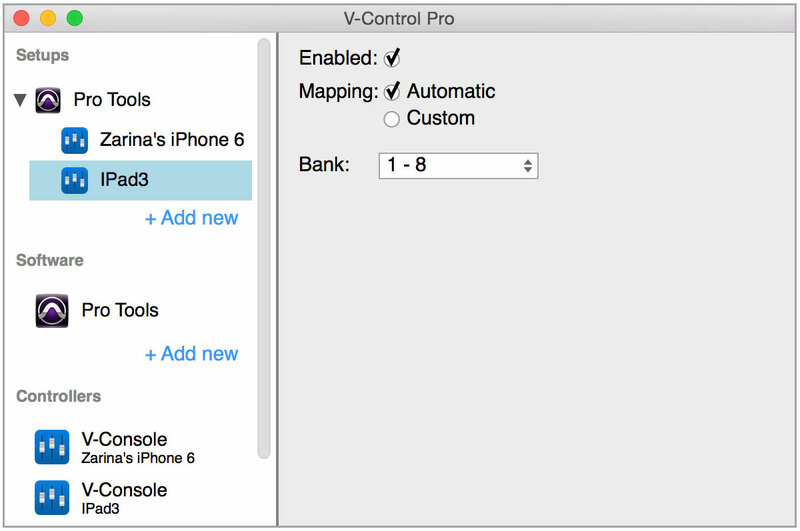 Check out this blog post ‘How Does Legacy iPad V-Control Pro 1 Work with the New V-Control Pro 2 System for more details.